Three-time major winner Padraig Harrington went from five ahead to two behind, before ultimately clinging on for a two-shot win at the Indonesia this morning. It has been four years since the 43-year-old Dubliner won a full-field event, although he did notch up a victory at the 2012 PGA Grand Slam of Golf when filling in for Rory McIlroy in the competition. A record which has seen him slip to 385th in the world rankings. Harrington led by five shots overnight and by four after the players had completed their weather-affected third rounds. By the time Harrington double-bogeyed the 7th hole, he trailed by two to Thai golfer Thanyakon Khrongpha. The Irishman and the 24-year-old Thai headed down the last level at 16-under but both found trouble. Harrington hit his tee shot to the edge of the hazard, with the Thai failing to capitalise by dumping his second in the water en route to a double bogey six, while the Irishman recovered to record a par four. "I had a bad break on the 18th hole when I hit my tee shot and it rolled to the edge of the hazard," Harrington told reporters. "I was about to chip my ball sideways to the fairway but when Thanyakon hit it into the water, there was no point to take a chance. So I went back to the fairway and hit my six iron for my best shot of the week." 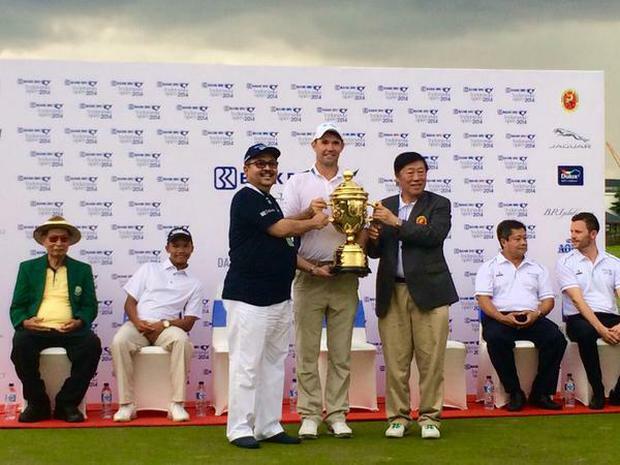 The victory was Harrington's first at a full field tournament since he lifted the 2010 Johor Open title, also on the Asian Tour. "Winning is a good habit to have. It gives you a lot of confidence and I need that confidence. "I didn't start too well but I came through and I got the win. This win brings a lot of confidence to my game and hopefully it will show up next year."